Spiker will coordinate implementation of corporate partnership efforts involving the Bureau of Reclamation's power functions and serve as the liaison on intergovernmental initiatives associated with hydropower delivery and be responsible for Reclamation's overall compliance with Federal Energy Regulatory Commission Mandatory Bulk Electric System Reliability Standards. The availability of hydropower from Reclamation facilities is key to the stability of the electric transmission system in the Western United States and supports the development of renewable energy throughout the West. 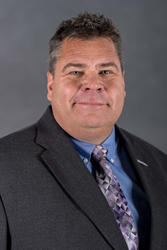 Bureau of Reclamation Commissioner Estevan López announced today the selection of Max Spiker as Senior Advisor for Hydropower and Electric Reliability Officer. Reclamation is the second largest generator of hydropower in the country; its 53 power plants annually generate an average of 40 billion kilowatt hours of electricity, enough to meet the demand of 3.5 million homes. "The availability of hydropower from Reclamation facilities is key to the stability of the electric transmission system in the Western United States and supports the development of renewable energy throughout the West," Commissioner López said. "Max’s extensive experience from all levels of power operations and management, including working collaboratively with Reclamation’s customers, stakeholders and industry, will be a great asset to Reclamation as it ensures the reliable generation of clean renewable electricity into the future." As senior advisor, Spiker will coordinate implementation of corporate partnership efforts involving Reclamation's power functions and serve as the liaison on intergovernmental initiatives associated with hydropower delivery and be responsible for Reclamation's overall compliance with Federal Energy Regulatory Commission Mandatory Bulk Electric System Reliability Standards. He will also coordinate activities in collaboration with the U.S. Army Corps of Engineers, Bonneville Power Administration, Western Area Power Administration and the Tennessee Valley Authority. Since 2013 Spiker has been the power resources manager where he worked with Reclamation offices in managing Reclamation's hydropower operation and maintenance program, reliability compliance program and renewable energy program. He joined Reclamation's Power Resources Office in 2010 as the operation and maintenance program manager where he provided policy direction and oversight. He previously held multiple positions including mechanical journeyman at Hoover Dam, facility manager at Green Mountain Dam, Estes Lake and Marys Lake power plants, facility manager of the Colorado - Big Thompson Project and power manager of the Upper Colorado Region where he managed the power program on the upper Colorado River and its tributaries, including Glen Canyon Dam, Flaming Gorge Dam and the facilities on the Gunnison River. Spiker has more than 28 years of experience with Reclamation. He graduated from Weber State University in 1988 with an Associate of Science degree in Construction Technology. He begins his new responsibilities this week.